The story of Esther shows us how God is writing a story with a happy ending, however challenging things are now. He wants Christians to be expectant people. God is calling us at King’s to be an expectant people, to believe Him for a church that is for all, for all Edinburgh, and where all of us are all-in. What do expectant people look like? 1. Expectant people are not defined by their present circumstances (Esther 4:13). Esther was in an extremely precarious situation, and may have felt that the compromises she’d been forced into disqualified her from being used by God. When God calls us to act in faith, most of us have some convincing-sounding reasons to reply in the negative. These betray a lack of expectation – that God would do amazing things, and do them through the likes of us. God prefers to work through people who know they are weak, so that He is the one who (rightly) gets the glory. 2. Expectant people burn their bridges (Esther 4:16). Christians can spiritualise passivity and unbelief; instead, we should pray, and then act boldly. Not every decision a Christian makes will have a life or death feedback loop but many of them will require dying to ourselves, our preferences, our comfort, our reputation. The world is upside-down from God’s way, so anyone following Him is going to look odd. We may have to make awkward changes, and risky decisions. 3. Expectant people will be vindicated (Esther 5:2-3 and on). Sooner or later, we’ll be proved right. Esther’s story teeters on the edge of horror but ends happily – which is the shape of history. We know how the story will end because Jesus is alive forevermore and has won eternal life for all who put their trust in Him and follow Him. Even if the risks we take don’t all come off, even if persecution engulfs us and brings us down to the grave… Jesus will raise us up, Jesus will commend us for our faith, Jesus will bring us to Himself – and in the presence of this King there is fullness of joy forevermore. Which of the three vision statements do you feel most excited about: a church for all, a church for all Edinburgh, a church where all of us are all-in for Jesus? What are you doing to bring this about? What did you find interesting/challenging about Esther’s story? When have you found present circumstances pressurising you to disbelieve God? 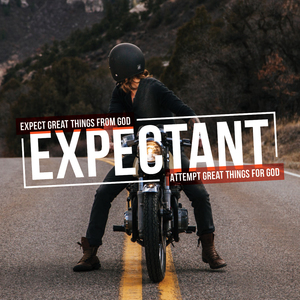 What are the lies we believe that successfully tempt us not to expect great things from God? What can we do about this? When have you had to “burn your bridges” because of your faith? How did it feel? Did you agree with Luke that we don’t always need special guidance to make radical choices? What awkward choices / risky changes do you need to start making? What guarantees do we have that we will be vindicated if we trust Jesus? How can we remind ourselves of these and live in the good of them? How can you as a small group encourage one another to be expectant?